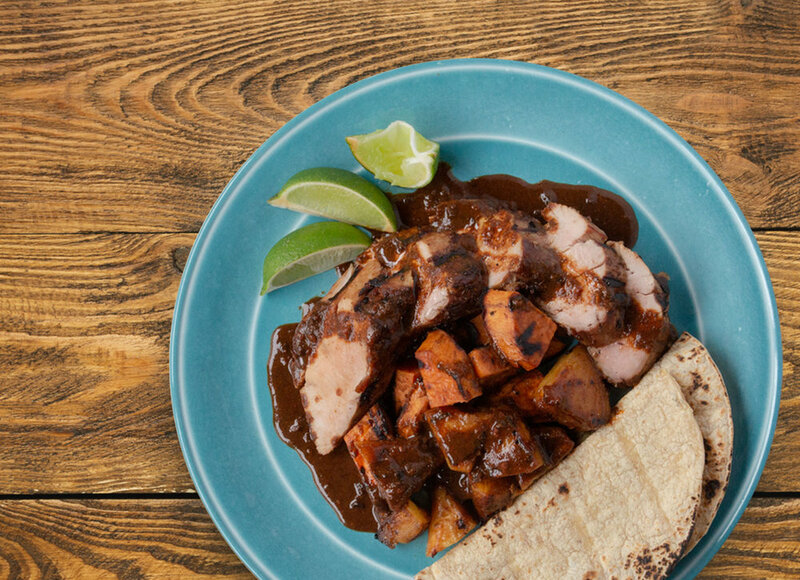 Succulent pork tenderloin is grilled with sweet potato and juicy, caramelized pineapple then smothered with spicy, fruity Manchamanteles Chile-Fruit Sauce Starter for an easy, savory-sweet meal. Great for a crowd, serve with plenty of warm tortillas for scooping and sopping up sauce. Heat a grill to medium high temperature. Peel the yam and cut ½” slices, place these in a large bowl. Clean the pineapple and cut ½” slices, place these in the bowl with the yam. Toss 1 tablespoon of oil, 1 tablespoon of salt and 1 teaspoon of ground black pepper into the yam and pineapple. Set this aside. Use the remaining oil, salt and pepper on the pork loin and place on the grill. Turn the pork every 3-4 minutes creating a caramelized grill crust on all sides. Cook for 12-15 minutes overall and remove the pork to a platter. Cover this with aluminum foil and allow it to rest while grilling the yam and pineapple slices. Combine the Manchamanteles Chile-Fruit Mole Sauce Starter with water thoroughly and heat to a simmer. Slice the pork and arrange on a platter with grilled yams and pineapple. Ladle generously with Manchamanteles Chile-Fruit Mole Sauce Starter. Garnish with fresh chopped cilantro and warm grilled tortillas. Manchamanteles Chile-Fruit Mole Sauce Starter is a flavorful, spicy-sweet blend of chiles, fruity pineapple, savory spices and a hint of a cinnamon and cloves.